Traffic on westbound of Interstate 70 is backed up as seen on June 18, in Frisco. Colorado voters have a lot to consider as election day inches closer, with the races for governor and attorney general heating up along with major ballot initiatives surrounding education spending and campaign contributions. But one topic sure to generate debate ahead of voting is transportation. Two transportation initiatives forced their way onto the ballot for this November, providing radically different solutions to Colorado’s traffic woes. For voters seeking to address the unsightly $9 billion backlog in the state’s transportation projects, the question is a philosophical one: to raise taxes or not to raise taxes. Proposition 110, commonly referred to as “Let’s Go Colorado,” seeks to raise the state sales tax rate by 0.62 percent from 2.9 to 3.52 percent for 20 years starting on Jan. 1. In addition, the initiative would authorize $6 billion in bonds up front to fund transportation projects. According to Let’s Go Colorado, the tax would raise in excess of $760 million in dedicated transportation funding in its first year alone. 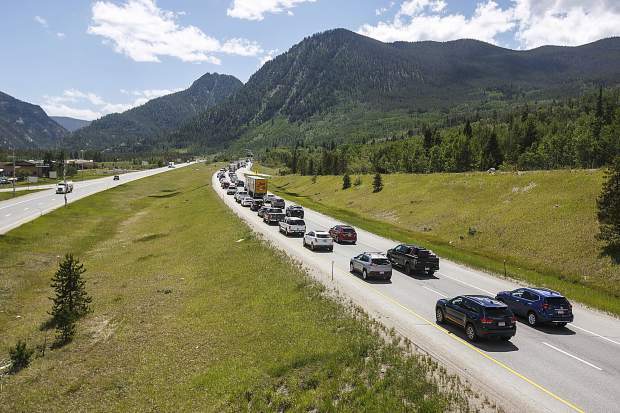 If passed, the initiative would divvy up the sales tax revenue between high-priority Colorado Department of Transportation projects, local governments and counties, and multimodal transportation initiatives. Forty-five percent of the revenue would go directly to 107 priority CDOT projects, 40 percent would be returned to counties and local governments to prioritize projects in their communities, and 15 percent would go toward the Multimodal Transportation Options Fund for improvements to mass transit and walking and biking paths. The competing measure, Proposition 109 or “Fix Our Damn Roads,” would authorize $3.5 billion in bonds to fund statewide road projects — namely bridge expansion, construction, maintenance and repairs — without raising the state’s sales tax. The proposition would prohibit state agencies from using the funds for ancillary costs like administration or broader transportation initiatives such as multimodal projects. Instead, Fix Our Damn Roads intends to fund a set list of 66 CDOT tier-1 road projects, looking to make as immediate an impact as possible. The initiative would leave it up to future legislators to find a way to repay the $3.5 billion in authorized bonds from the state budget. Proponents for Let’s Go Colorado argue that the 20-year tax increase is a more permanent solution to subsidize the state’s fledgling 22-cent gas tax, Colorado’s primary revenue generator for road repair and construction, which hasn’t been raised since it passed in the early ’90s. The tax would also mean that out-of-state visitors would be helping to fund Colorado’s transportation projects. Backers of the initiative also point to its flexibility in allowing local governments to prioritize their own projects, and to address issues on a broader transportation spectrum. Opponents of Let’s Go Colorado argue that the initiative lacks definition in the projects it will fund, asking Coloradans to bet on the unknown. Caldara also argued that Coloradans would simply refuse to approve a sales tax, further delaying any meaningful policies to address growing transportation funding concerns. On the other side, proponents of Fix Our Damn Roads argue that the responsibility to raise funds shouldn’t be on the public, but instead on the state government to fill in the gaps. Caldara referenced a number of state funded projects he views as wasteful like funding the new CDOT headquarters and providing corporate welfare and tax incentives for Hollywood films, claiming funds should be going to roads instead. Caldara referenced a 1999 transportation funding initiative passed under Governor Bill Owens called TRANS, which provided $1.7 billion in bonds to accelerate transportation funding on 28 road projects across the state as a similar success story. Backers also point to the set list of projects to be funded as a positive, removing guesswork from how the funds will be used. Opponents of Fix Our Damn Roads say that leaving it up to future legislatures to pay the debt is dangerous, and could potentially pull funds from health care, education or other funds. Additionally, the relatively narrower scope of projects set to be funded means less agency for counties and local municipalities. Regardless of which proposition ultimately garners more support, most agree that transportation is an issue that needs to be tackled sooner rather than later. A report published earlier this year by TRIP, a private national transportation research group, reveals some sobering numbers. According to the report, 40 percent of major urban roads and highways in Colorado are in poor or mediocre condition, and 6 percent of the state’s bridges are structurally deficient. The study also estimates that roadway features are likely a contributing factor in one-third of fatal traffic crashes, and that Colorado motorists spend an excess $1.9 billion annually on additional vehicle operating costs as a result of poor road conditions. CDOT’s 2017 Transportation Deficit Report also reveals serious funding issues. According to the report, the cost of sustaining current performance of pavement, bridges and maintenance will result in a 10-year deficit of $1.8 billion. The cost of achieving CDOT’s “vision” targets for these assets would lead to a 10-year deficit of $3.8 billion.